is the perfect way to explore the island's diverse landscape and history." 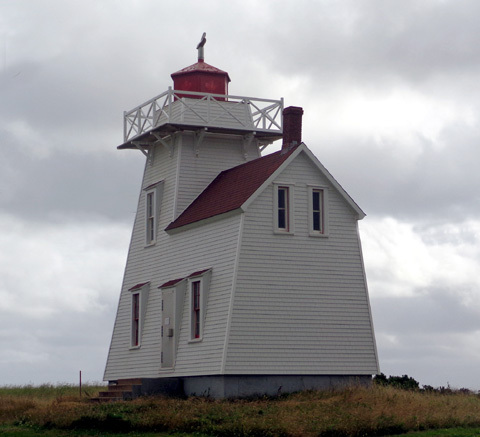 We simply don't have the time in just one week to follow all three of PEI's recommended coastal drives -- North Cape, Central Coastal, and Points East. 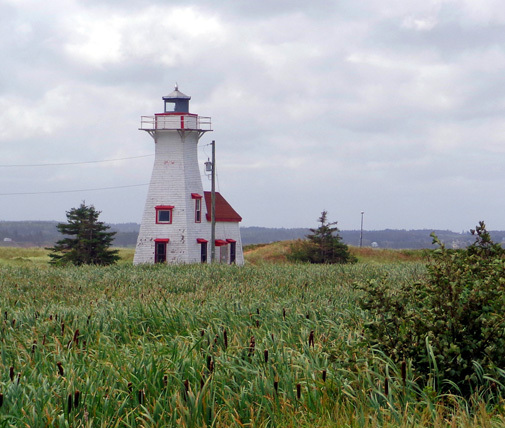 We decided to concentrate our day drives and bike rides to the north central area of the island between Malpeque to the west and St. Peters to the east. and shops/studios where you can buy high-quality arts and crafts. 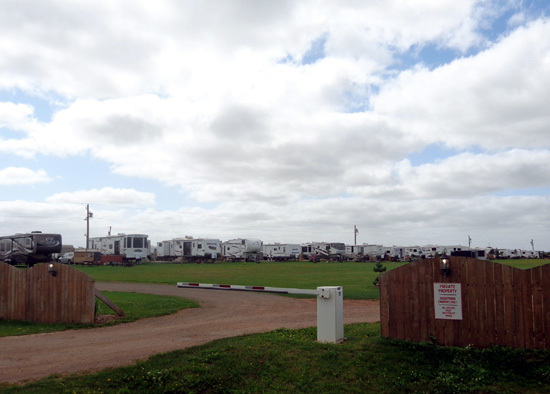 This entry focuses on two of our day trips to the area north and west from our campground in Harrington, which is a few miles NW of Charlottetown. Our goal was to find more of what makes PEI so memorable to visitors -- and why residents love it so much. 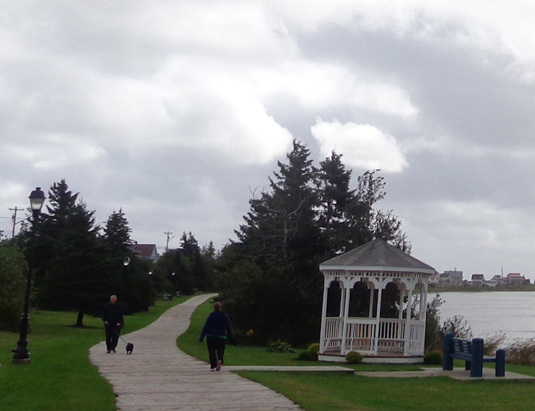 That day we went through the small towns of Brackley Beach, Rustico, Rusticoville, North Rustico, Rustico Harbour (do you see a trend here?? 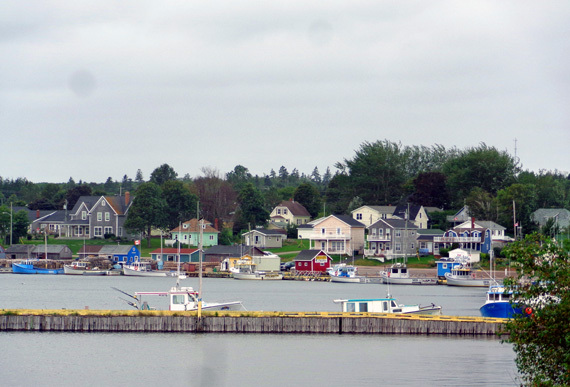 ), Cavendish, Stanley Bridge, New London, Springbrook, French River, Park Corner, Seaview, Bayview, Profitts Point, Malpeque, Fredericton, Hunter River, New Glasgow, and back to Harrington. I might have missed the names of a few towns . . . Sounds like a long drive, but the loop and a few side trips on little country roads totaled only about 75 miles. It's amazing how much we saw in such a short distance. We also did some walking but exercise wasn't the main goal that day; sight-seeing was. 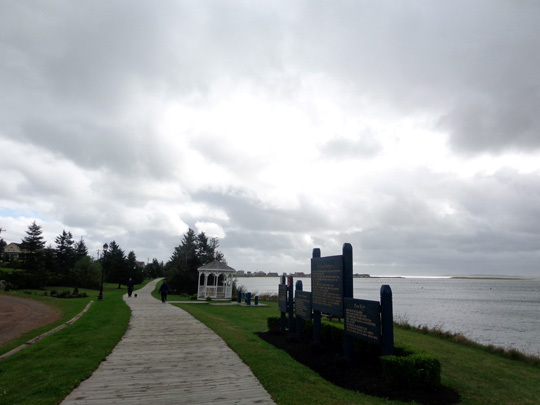 We retraced the first part of the route to Rustico Harbour on Monday (Labor Day) on our way to and from the Cavendish unit of PEI National Park to ride our bikes on a different segment of the Gulf Shore Way coastal trail. 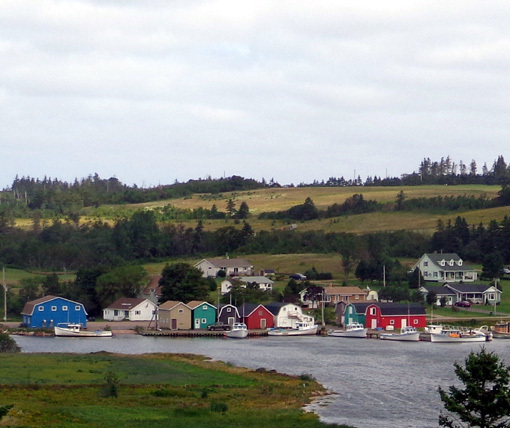 I'll feature photos from our bike ride in a later entry but include a couple photos here from the place where we ate at Rustico Harbour that day. The photos show how cloudy it was on Friday morning and on Monday. However, we didn't get into any rain either day while we were driving around. The temperatures were low enough (50s-60s F.) that we were able to take the dogs with us both days. 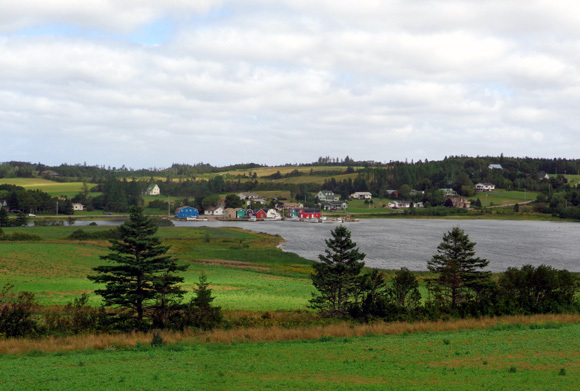 Rustico, Rusticoville, North Rustico, Rustico Harbour . . .
Those are the ones we drove through. There is also an Anglo Rustico nearby that we didn't see. 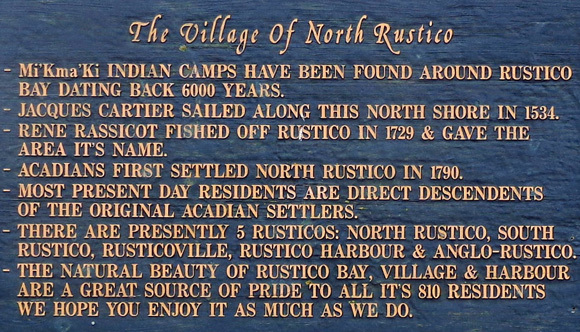 To make matters more complicated, Rustico is also known as South Rustico. I think. 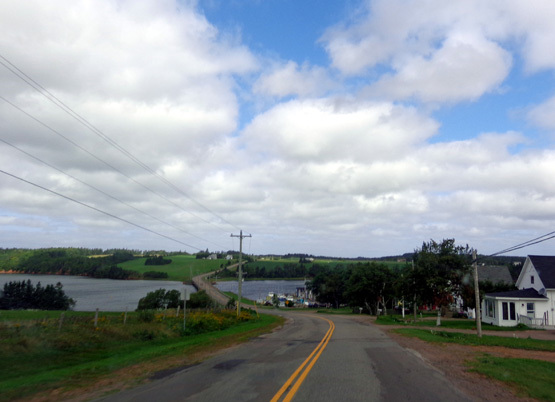 Down our rolling route to one of many stream/bay crossings; (South) Rustico is ahead. European settlers in the Maritimes sometimes did the same thing that European settlers in several places in New England did when naming neighboring towns almost identically. 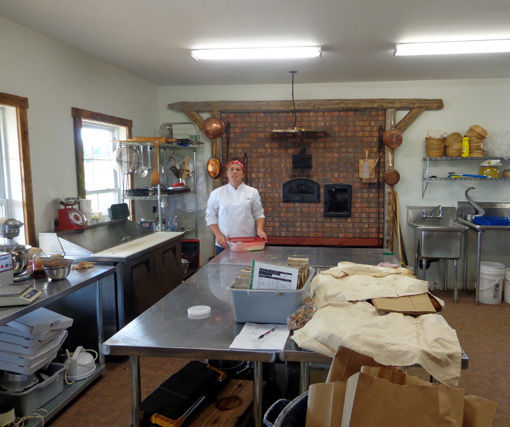 The Amana Colonies in Iowa are like that, too. It's charming, but a bit confusing at times for locals and visitors. 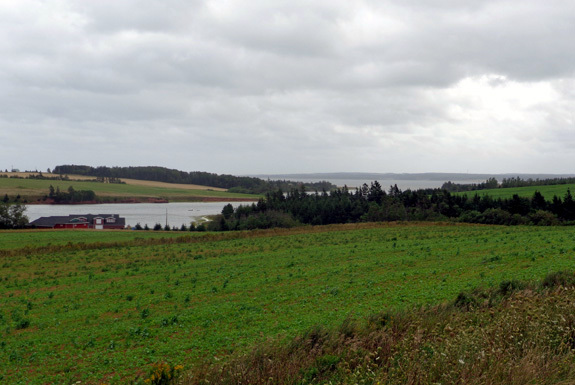 Rustico Harbour is shown in the distance, about a mile south of North Rustico. 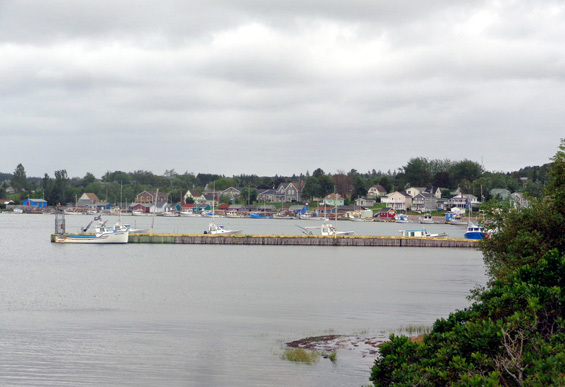 Above and below: North Rustico's harbor, not to be confused with Rustico Harbour down the road . 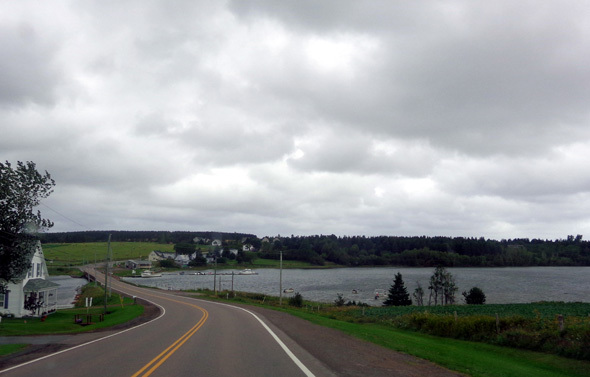 . .
Just down the road is Rustico Harbour. 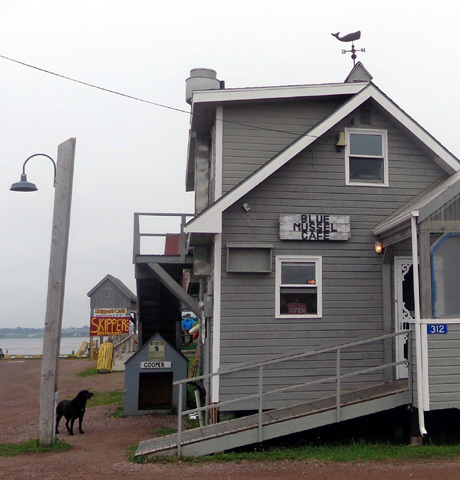 We didn't realize until later that one of the best restaurants on the North Shore is also located in Rustico Harbour, the Blue Mussel Cafe. It's in the same building as PEI Seafood. 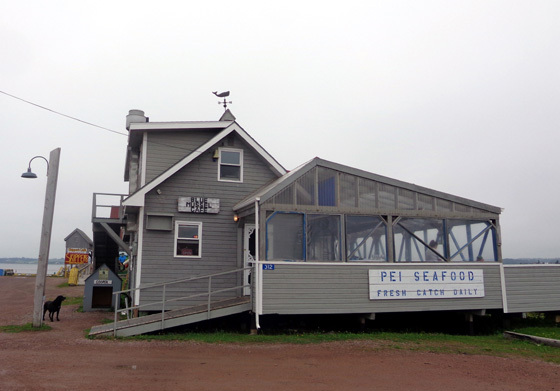 We detoured a little out of our way on Monday to find the restaurant when we were on our way to the Cavendish unit of PEI National Park to ride our bikes. We didn't see the little "Blue Mussel Cafe" sign on the unassuming gray building and had to ask another nearby business where it was. It was definitely worth the hunt. 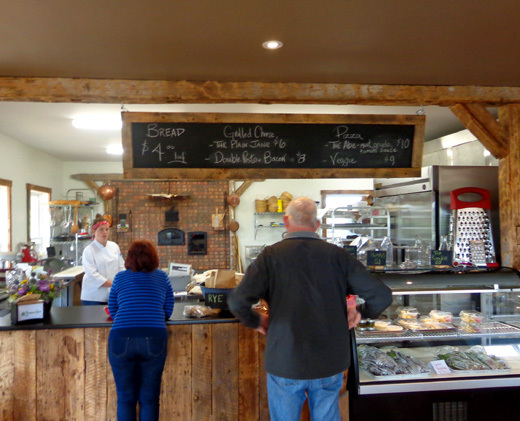 The Blue Mussel Cafe serves fresh local seafood and doesn't deep fry anything. Jim and I shared a huge bowl of blue mussels steamed in wine and garlic. We were served about 30 mussels in their pretty shells, which are blue inside, for only $11 CA. I wish I'd taken a picture of them. They were delicious and we felt like the cost was very reasonable. We also each had a roll and a big bowl of seafood chowder with more mussels, lobster, salmon, haddock, and chunks of PEI potatoes and carrots. Yum! We can heartily recommend this place to seafood lovers. Cooper stands to greet the next customers. Greeting us at the door (above) when we first arrived at Blue Mussel was Cooper, an elderly black Lab. He was tethered to his outdoor house but close enough to the entrance to the restaurant for visitors to pet him. We did, of course. We're dog people and, more specifically, Lab people. Jim took Cody, our own elderly black Lab, over to greet Cooper but we left Casey-pup in the car; she would have been too rough for Cooper, who has more gray hairs than 11-year-old Cody does. We continued up and down the rolling hills on Rt. 6 above more water and past more farms on our way to the town of Cavendish. 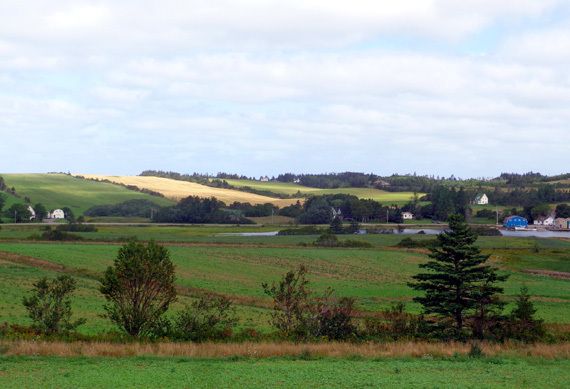 Cavendish is known worldwide for its connection to the popular children's book series, Anne of Green Gables. The original book was written over a century ago. 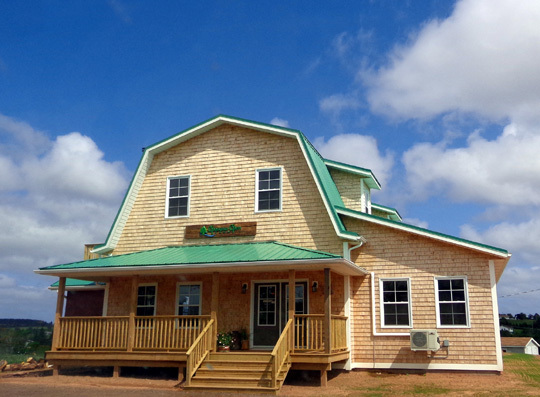 This area of PEI is even called "Green Gables Shores" in promotional publications to lure more visitors. 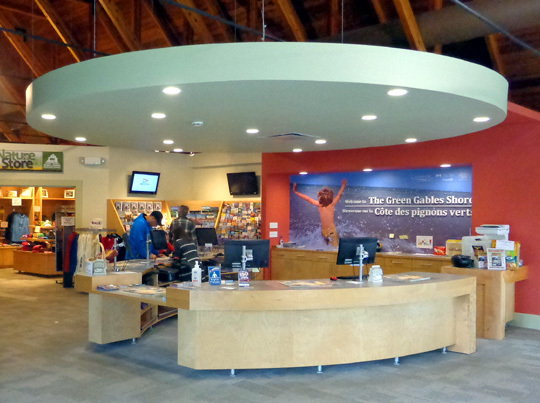 Devotees of the books, film, and TV miniseries come here to visit the sites mentioned in the books and to pay tribute to their favorite red-haired heroine and her creator, Lucy Maud Montgomery. I can't remember if I ever read any of the Green Gables novels as a child. I read a lot, so I probably did. Anne wasn't the reason we came here so all we did in the area on Friday was to go to the nice visitor center in town. In retrospect, I wish I'd gotten a second shirt of the same design in dark blue, too. I love that shirt. 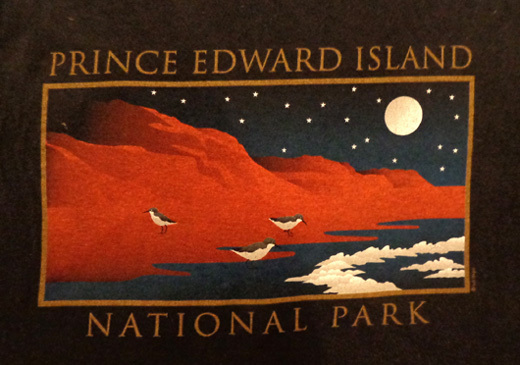 It's my only physical memento from PEI. We drove an arc around the south part of New London Bay, part of the Gulf of St. Lawernce, from Cavendish to French River on Rts. 6 and 20. I don't know if the tide was coming in or going out, but that's pretty cool. Remember, all these prices are Canadian. With a favorable exchange rate this summer, our cost was always less. Soon we came to a pull-off with interpretive signs on a high point overlooking a beautiful valley and the picturesque fishing village of French River. Note the farm fields in the valley and on the hill above town. No wonder photographers and painters love this view! 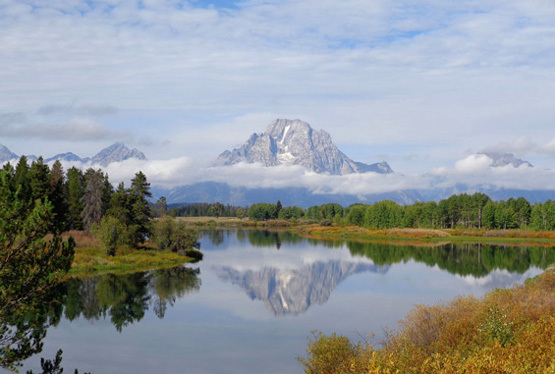 One comment on an interpretive sign at the overlook says, "Among the area's most unique features is the contrasting yet complimentary combination of water view and farmland within a single vista." We saw that many times on our loop near the North Shore on Friday. I showed a close-up of the village from this overlook near the top of this page. The village is quite interesting up close, too. A little past French River we took a detour on a little country road in search of two lighthouses on the Gulf of St. Lawrence. The sign on the shed said to come on in to choose the bags of veggies self-serve style. The prices were listed for each sack; payment was on the honor system. We chose a 10# bag of freshly-dug new potatoes and 2# of bright green beans and left a little more $$$ than requested, just because. 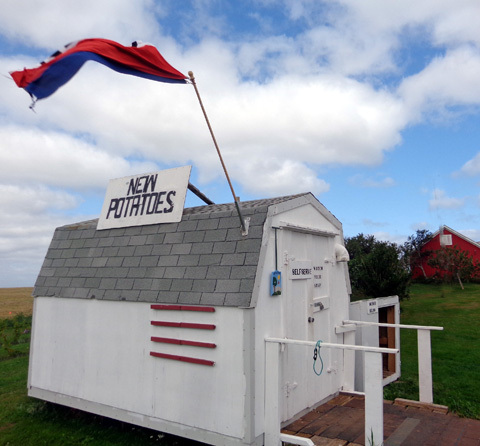 PEI potatoes are renowned for their unique flavor derived from the particular soil on the island. We can testify that they are good. That evening we had a delicious dinner of stir-fried scallops, steamed clams, new potatoes, and green beans -- all locally caught/grown and as fresh as can be. It was as satisfying as that lobster dinner we prepared at Whale Cove. We had lots of potatoes and green beans left for subsequent meals. 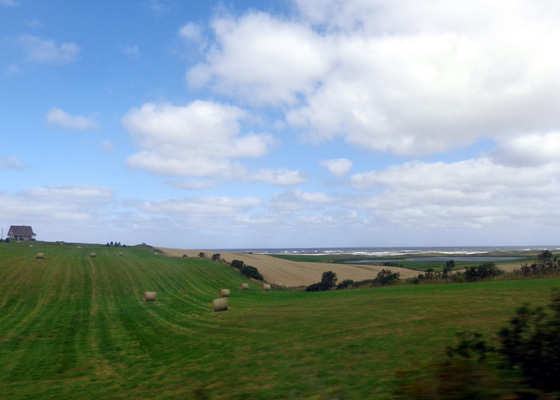 Love the rolling green field with hay bales and the white-capped waves of the Gulf of St. Lawrence in the background! I think it'd be fun to be a farmer on land with a view like that. 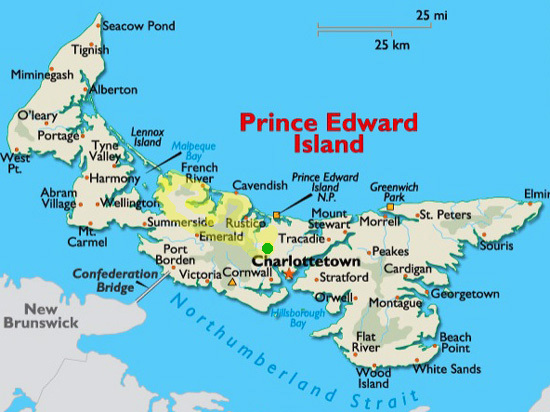 That visitor in Nova Scotia who complained that all the potato fields on PEI make it look just like Ohio? I have no idea where he was traveling on the island, but it sure wasn't along the North Shore! This is gorgeous terrain and not at all monotonous, as he portrayed the island. I hope he didn't discourage anyone he talked with from visiting PEI. It looked like there were a couple hundred campers on both sides of the road, all within a short walk of the water. There's a beautiful aerial photo of the campground on the homepage of the campground website. It looks like a very nice place to stay for a few days or all season. 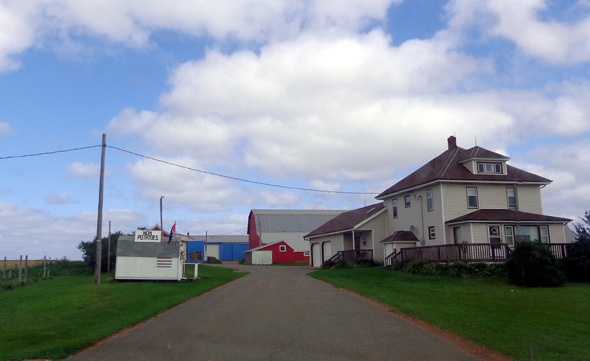 We didn't stop in the town of Malpeque, the farthest west we got on our loop route on Friday. Malpeque Bay is famous worldwide for its oysters, which are considered the gold standard by which all other oysters are judged. One of my nieces loves Malpeques. When we told her we were going to PEI she said we had to buy some. She orders them and has them sent to her home in the States. 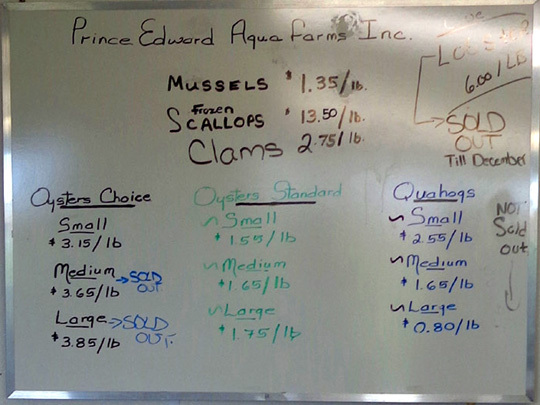 Since we had already purchased scallops and clams from another seafood shop, we didn't get any Malpeque oysters. 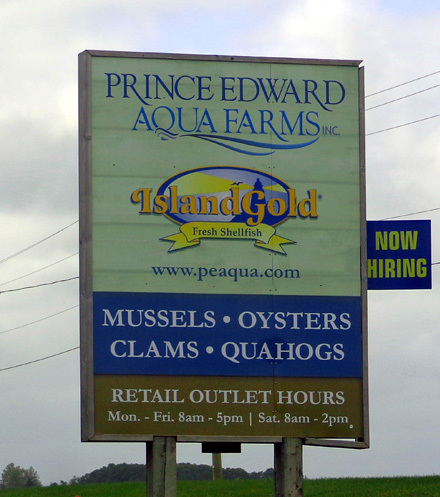 I'll mention more about oyster and mussel cultivation on PEI in the next entry. 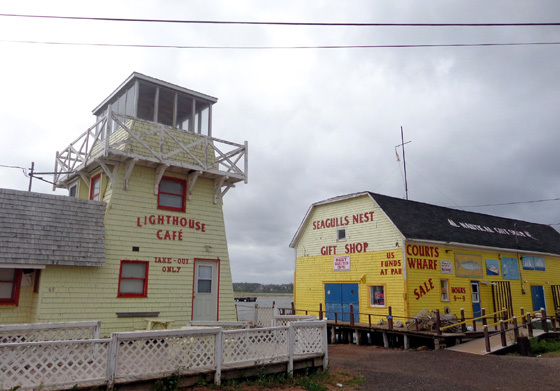 By the time we got around the loop on Friday to New Glasgow, which is a little southwest of Rustico, we were about starved for some lunch. We had looked for an appealing, reasonably-priced seafood restaurant after leaving Cavendish but didn't find one that suited us. 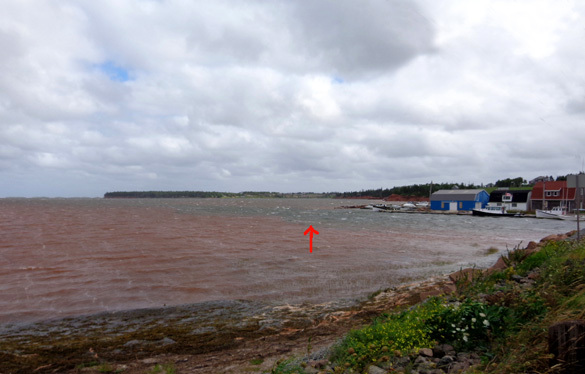 Even if we'd known about the Blue Mussel Cafe that day, it was too early to eat lunch when we were at Rustico Harbour in the morning. They bake a variety of delicious bread products. They produce 15 flavors of gouda cheese and you can see the equipment where the cheese is made (or the process itself, if you're there at the right time). They make awesome pizzas and sandwiches. This makes a great lunch stop or place to just pick up some cheese and bread. We did both. We ordered a delicious "Abe" pizza with gouda and bacon on it. The cost was only $10 CA for a 12-inch pizza loaded with toppings, one of the better deals we've found in the Maritimes. 12-inch veggie pizzas $9. They're less than that for us, with the current favorable exchange rate. After we ordered the pizza we watched it being assembled and put into the brick oven. I like places where you can see the cleanliness and attention to detail. Little rounds of gouda cheese mellow out in a refrigerated room. We saw the equipment where the cheese is processed but none was being made while we were there. Before we left we bought two types of gouda to take home with us. By then it was sunny and getting too warm to leave Cody and Casey in the truck for very long so we went outside to scarf down our pizza and let the dogs lie down in the grass. We had nice views of the surrounding countryside. After a 15- or 20-minute drive through more beautiful terrain we arrived back at our campground in Harrington, where we just relaxed the rest of the day.